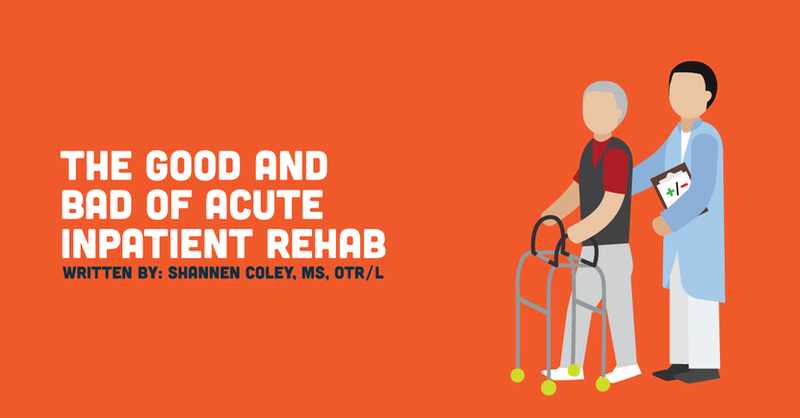 So you’re thinking about becoming an acute inpatient rehab OT? Newly graduated, in the midst of studying for the NBCOT, and on the pursuit of applying for a plethora of OT jobs: sound familiar? There are so many settings from which to choose: outpatient ortho, home health, acute inpatient rehab . . . the list goes on. At this point you’re feeling nervous. Fieldwork experience helps tremendously in identifying and solidifying your interests in prospective patient populations and types of working environments, but you still aren’t sure about your ideal setting to kickstart your career as a new grad OT. First and foremost, every OT setting will have its challenges alongside many highlights. Sometimes it can be reassuring to have a subjective perspective in that setting in order to determine if it is a place you can see yourself being, growing, learning, and thriving. What is acute inpatient rehab? Often referred to as an Acute Rehab Unit (ARU) or an Inpatient Rehab Facility (IRF), this post acute care setting is hallmarked by a patient receiving intensive therapy services at least 3 hours per day, 5 days per week. These services involve specialized and skilled intervention from at least 2 -3 rehab therapies (Physical, Occupational, Speech Therapy). The length of stay typically varies from about 7 days to 28 days depending on how debilitated the individual, as well as any medical complications and comorbidities. Patients in this setting are typically moderately-severely impaired functionally and medically as well as not yet at the stage to transition back to their home (which is always the goal) or to the least restrictive environment such as an assisted living facility. The fact of the matter is after a major medical complication, many individuals need more than a brief acute care stay before they can safely return home. Now let’s dive deeper into the challenges and highlights of working in this setting. In this setting you complete A LOT of detailed documenting. There are daily treatment notes, Functional Independence Measure (FIM) score notations, chart reviews, evaluations, discharges, individual plan of care notations . . . etc. At an ARU, insurance expects detail that shows the skill that we provide as well as the step by step progress that demonstrates a patient’s likelihood to return home. In addition, registered therapists attend weekly Team Conferences, which bring more documentation emphasizing a patient’s progress or limitations to progress week to week. Let’s be real, things happen in every setting that delay or impair therapy from beginning on time or being completed to the full duration. Flexibility is key in this setting, because the vast majority of the patient population served are fragile. Physicians may order a STAT CT or even a Therapy Hold due to a patient’s medical decline. A phlebotomist may have orders to draw blood for different tests. Radiology might interrupt a therapy session due to necessity to perform a Modified Barium Swallow as a result of suspected aspiration. You may walk into your patient’s room while he or she is having an elective respiratory treatment. Nursing might be administering medications during the patient’s scheduled therapy time due to patient complaints of nausea or increased pain. Although not ideal, all of these factors are a part of inpatient life! Yet another event out of your control is reality in all settings: A few members of the healthcare team might be content with performing their job duties at the bare minimum. This is a limiting factor in patient outcomes. Perhaps a patient states that he or she “can do everything” for himself/herself. This is where we gently allow our patients to attempt to perform their self care routine during our ADL assessment, which usually leads to increased insight in regards to what tasks of their daily routine that they cannot complete independently. Nonetheless, although we know physical therapy includes much much more than walking and building strength, we OTs admit we are jealous when patients at initial evaluation tell us “they just want to walk more” . . .
Compassion fatigue is stress that occurs from helping or wanting to help others who are experiencing trauma or suffering. A common maxim is to “leave work at work.” This, frankly, is much easier said than done. There are and will be many times you will leave the hospital thinking, wishing, yearning to do more, be more, and give more of yourself to your patients. These unending feelings of hopelessness at times may cause therapist burnout which can then lead to compassion fatigue. In order to provide skilled therapy to empower health and wellness while working toward enabling functional independence you must put your own self care first. Some patients just do not want to get better. This is by far the most distressing and profoundly difficult challenge to understand and accept in my opinion. As a new grad (or even as a senior therapist) it is natural to think that you can find a way (using motivational interviewing, positive reinforcement, client-centered care, empathetic listening, etc) but there will be patients who are content in their function. Likewise, you will come across family members who unfortunately enable the patient to rely on them. This is hard to report, but necessary to mention. FIM all day everyday!!! At an ARU, expect to FIM every patient. Therapists of every discipline, nursing, and even social work contributes to “FIMming” every patient. What does this mean exactly? The Functional Independence Measure (FIM) is an assessment tool used to track changes in the functional ability of a patient during hospital care in a rehabilitation setting. You can expect an Admission assessment within the first 72 hours of the start of rehab care; whereas Discharge assessment will be collected within the last 72 hours of care. Comprised of 18 items, there is a Motor subscale and a Cognition subscale which are scored on a 7 point ordinal scale ranging from 1 - Total Assistance with helper all the way to 7 - Completely Independent. Occupational therapists are extremely valuable to this setting as we play an instrumental role in all 18 items especially Eating, Grooming, Bathing, Upper Body Dressing, Lower Body Dressing, Toileting, Transfers, among others! Therefore, because all disciplines utilize this tool there is more congruence and understanding in regards to the level of assistance the patient requires. One of the best aspects of working in an inpatient rehab unit is the emphasis on “occupation”. This setting as mentioned above operates with the intent of discharge to the community home environment. The treatment focus is on functional independence in self care, mobility, cognitive, bowel and bladder management, and community reintegration while simultaneously working toward stabilizing medical needs. In acute inpatient rehab, a therapist can only “FIM” (see above) if the patient performs the actual task in all of its parts. In other words, simulations of occupations does not suffice the demands of this setting. AKA to assess a patient’s ADL skill level, they actually will complete the entire routine including taking actual showers. Performing the occupation to its full capacity allows the therapist to develop an intervention plan that addresses the specific factors such as decreased ROM and activity tolerance, poor safety, or impaired sequencing that are limiting independence. Have a doctor’s appointment at 8am or have to pick up your little cousin at 5pm? In an inpatient setting (and in most cases especially if you communicate with your program director and fellow therapists in advance) you have some sort of flexibility in your workday and will be more apt to having a few short days to compensate later with longer hour days. Huge bonus. Highly recommend this setting for this reason!! Miscellaneous -Cancer, Debility, Lymphedema, Cognitive Impairments, Macular Degeneration… and so much more!!! All of the above mentioned may be further complicated by a significant number of comorbidities such as Morbid Obesity, Renal Failure, Diabetes Mellitus, having a Wound Vac etc. . . . If you are hoping to broaden your perspective and increase your clinical competence in evaluating and treating a wide range of diagnoses, this is a good setting. In this setting it is more typical to be paid hourly than salary which provides a great opportunity to achieve overtime pay to pay back those hefty student loans. There are typically opportunities for cross training (such as performing administration work, or working as a FIM coordinator) which may also increase the number of hours you work equating to increased pay. Every specific ARU is different, but you can expect to be paid at least the average salary for that state. The median national annual wage for OTs working in this setting according to bls.gov is $81,910. In other settings you might only see the doctor 1x/week, but in this setting you will be in contact with a multitude of physicians in addition to the medical director who is typically a physiatrist. Nurse practitioners, physician assistants, wound care nurses . . . etc. Personally, I have learned from a Care Assistant how to put telemetry wiring through a hospital gown! The opportunity to learn from others of all disciplines is endless! Acute inpatient rehab units offer a dynamic and valuable experience for new grad occupational therapists. The multitude of people from your patients to family members to other therapists to the medical staff that you interact and collaborate with daily provide you with a chance to flourish while developing your clinical skills. All settings have their ups and downs, and it’s important to note that this Challenges and Highlights list is not all-inclusive! Interested in sharing your perspective or experience in acute inpatient rehab? Leave us a comment!